Right next to Shinsegae Department Store, conveniently located hotel in Namdaemun market. Hotel Myeongdong, opened March 15, 2012, is conveniently located at the heart of Namdaemun market and only 5min walk away from Myeongdong. The hotel is at the entrance of Namdaemun from Shinsegae Department Store so it is easy to find the hotel. There are 2 types of rooms (twin and triple), and rooms are equipped with closet, TV, refrigerator, A/C, etc. PC with internet access, city map, tourist information are also available. Shopping mall Messa is right in front of the hotel, Daiso and eyewear shop in 1F of the building and Shinsegae Department Store right beside the hotel so it is a perfect location for shopping. The environment is nice to take a good rest as it is pretty quiet at night. Hoehyeon station, subway line 4 is within a walking distance therefore access to Seoul station and other tourist sites is also convenient. The area is also suitable for dining as there are Korean noodle restaurant, Korean barbecue restaurant, grilled fish restaurant, etc. 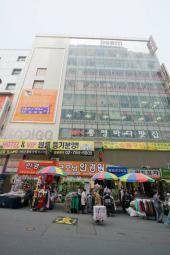 Visit Hotel Myeongdong to enjoy shopping, sightseeing, dining and everything in Seoul.